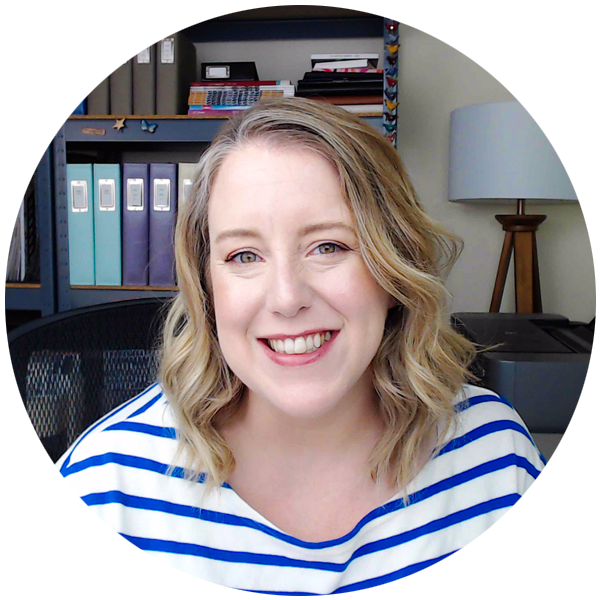 Within the online community of scrapbookers we talk a lot about stories and the value of recording them. We even often emphasize the importance of telling your own story. The thing is, it’s easier to tell the story of your daughter’s first Christmas than it is of the one where you were really disappointed. Easier in so many ways. So we often don’t focus on scrapbooking our own pasts. It’s not because we don’t want to or that we don’t value our own story, but because it can feel… well, harder. Since the vast majority of us didn’t grow up in the digital age, lack of photos can feel like an enormous barrier to telling stories from your younger years. In this post I want to break down this barrier and demonstrate how you do have enough photos. 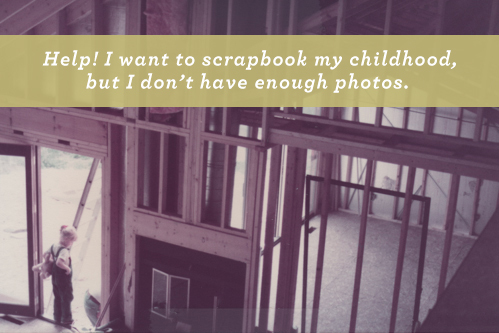 I’ll share some of my best solutions to the most common photo-related roadblocks to scrapbooking your own growing up story. I only have a few photos or none at all. Solution | Lack of photos should not deter you from telling stories. There are are two simple ways in which you can cope with not enough or no childhood photos. Use surrogate images. In place of the photo you wish you had, use memorabilia, a stock photo, or a related photo from today. Use journaling. While you may not have a photo, you still have your memories. Describe in detail the photo you wish you had. My photos are in complete disarray. Solution | It isn’t necessary to have a perfectly-organized photo library, with everything digitized, in order to start scrapbooking your childhood. While the process can help you identify future photo management needs, a rapid run-through to select key images can help you get started scrapbooking sooner rather than later. My photos are somewhere else. Solution | If permanent relocation of your photos to your home is not an option, a visit to their location might be. I was able to scan almost 200 childhood photos in a day at my parents’ house. I wasn’t trying to be exhaustive, but simply select the highlights from across multiple decades so I would have some photos. My photos are on magnetic pages. Solution | I’ve heard of people successfully using dental floss, fishing line, or the spatula for a die cut machine to successfully remove photos from magnetic pages. I prefer to scan the entire page on a flatbed scanner and crop the photos on the computer. While removing them may be the best long-term solution, scanning is a better short-term solution. Solution | Free (PicMonkey, Picasa) and low-cost (Photoshop Elements) software exists to help you restore the color and quality of older photos. However, I don’t think that’s always necessary. I want to get my photos scrapbooked, so I embrace their vintage coloring. I don’t have a scanner. Solution | While scanners are inexpensive these days (or bundled with your all-in-one printer), you can alternately take images to a local photo center, have them scanned by mail order, or even use an app on your phone to “scan” them. When there’s a will, there’s a way. Almost every challenge related to older photos has at least one workable solution to help you get your stories scrapbooked. If you’d like a step-by-step process for creating an album about your childhood, I’d like to invite you to join me for the Before Your Story workshop. During class I’ll directly help with any challenges you face, so don’t let lack of photos deter you from telling the most important story of all: yours. It’s amazing what your posts can trigger, Jennifer. This one where you talked about Christmases in your past triggered three memories for which I only have one photo and I actually don’t remember the event as I was just two years old at the time. But I remember the story that goes with the picture so that important. When you said something about a picture of something similar I realized I can scan a picture from the web or a magazine of popcorn stitch crochet/knitting to give the idea of the sweater given to me by my father. And finally, I’m sure I can find some picture of a Lionel train set to remember the year I got a train. And yes, girls can play with trains, too. Could this class also work if you wanted to make a scrapbook for my parents of when they were babies? Yes, I can see that working. To do both in one album, you’d have a slightly different configuration but I have an idea about how to do it. Ok that is great. Thinking about this for my siblings as well and perhaps my husband. Awesome Patty. Thanks so much. See you in class! Wow,after reading this I realized that the numbers were being a problem as much as the pictures. So I am excited because I simply made a commitment to tell seven stories in BYS. Each one to represent a different decade and the last one to be my dreams for the future. Now I am less intimidated and finally excited about this new project. A way to record my life prior to and including now for my grandchildren. I have a really awesome idea about how to merge this seven story idea with the structure in the class. I’ll be able to explain it fully once we get started but I can see you doing seven simple layouts (these key stories) with 28 (7×4) short journaling tidbits on the back. I have started to write down the different jobs I had and short worded experience reminders. This is finally sounding like a great album project. I am anxious to hear your ideas in class. I have even photographed the photographs. Set them out in good indirect light (outdoors in the shade is perfect) and focus carefully. Works great in a pinch! Yes, that works so great too! It’s the basis of how the “scanning” apps work with the benefit of straightening and skewing built in.